Peace Fellows Ginny Barahona (left) and Sarah Schores, from Georgetown, volunteered in Afghanistan in 2004 . 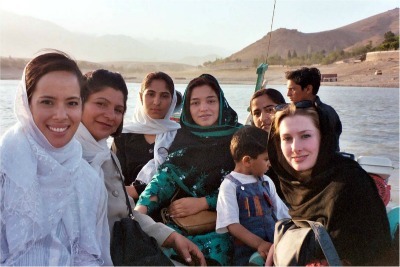 Our fellowship program began in 2003, when eight graduates signed up as Interns for Peace (photo). Numbers grew quickly and by 2009 we were recruiting well over 40 students. That was hard to manage, and we have since reduced numbers drastically. From the start, we have asked Fellows to profile the work of their hosts through blogs, which can all be read on this site. Blogging was so innovative in those days that we were profiled in Wired.com. In the years since, several of our campaigns have begun as blogs. For example, our work on uterine prolapse was inspired by Nicole Farkouh’s powerful blogs from Nepal in 2007. Our campaign with GDPU to bring accessible toilets to northern Uganda began as a blog by Rebecca Scherpelz in 2011. All of our advocacy quilts were made with help from Peace Fellows. Our fellowship program has two beneficiaries in mind. First, there are our community-based partners, who receive technical support and resources that they will not get elsewhere, free of charge. This includes friendship; IT skills; international connections; English language support; money; and fundraising proposals. 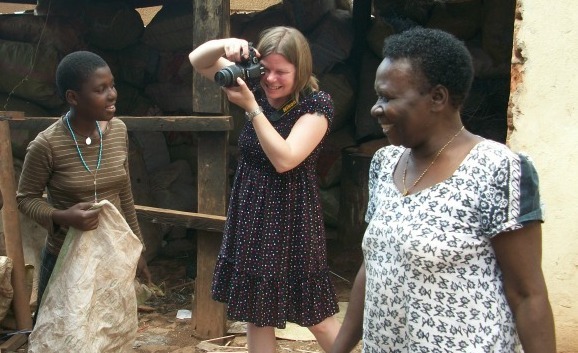 Peace Fellow Scarlett Chidgey used her skill with the camera to capture powerful images for her host, the Kinawataka Women Initiatives in Uganda. In the second category are the Fellows themselves. Our progran seeks to build character and we expect Fellows to become more confident about working in a different culture and also committed to service. Some, like Matt Becker, have faced real adversity. Matt suffered a ruptured appendix in Bangladesh and went straight back to work with his host after leaving hospital. Many others arrived with visions of glamorous field travel only to find themselves marooned in a capital, amidst heat and traffic. Somehow they smiled through it all and emerged empowered. We also expect a fellowship to produce academic benefits. This can take the form of content for research papers, class presentations, or even an academic thesis. Ted Mathys (Fletcher School) produced a strong research paper on recycling during his fellowship in India that was launched at the Copenhagen summit on climate change. Stacy Kosko (Maryland) wrote her PHD thesis on her experience as a Fellow with the Roma in the Czech Republic. Stacy is one of several Fellows who have gone on to an academic career. Finally, we hope that Fellows will acquire skills and contacts that will benefit them in their future careers. With this in mind, we organize a week of professional training for Fellows at Georgetown University each May and work with Fellows after they return to school. This can involve supporting presentations, writing letters of recommendation or contacting potential employers. Our fellowships have been praised by Career Services at the universities where we recruit and we hope to formalize this relationship in 2017. 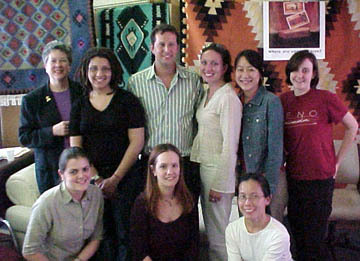 Trail-blazers: The first cohort of summer interns in 2003, with Maria Carland from Georgetown University (far left) and Jeff Bernstein from the One Small Step Foundation. Jeff generously funded two of the internships. We measure results through three evaluations during the fellowship cycle and also maintain a database on past Fellows. This allows us to publish the data on past Fellows that can be found on this page and it comes as no surprise that many alumni went on to work at universities, corporations, development banks, the US government, foundations and NGOs. One even worked at the White House. We value our continued contact with past Fellows and are encouraged that over twenty Fellows who served in Nepal have donated to our Nepal appeals. Our program has also produced unintended outcomes, including dazzling intercultural connections (box). This is one of our proudest achievements. Somehow, the world looks less divisive when seen through the eyes of these remarkable young professionals. It is never easy to find funding for short-term fellowships, and among those who have given generously to AP or Fellows we would single out NGO partners like Vital Voices, Survivor Corps, and IANSA; benefactors like Scott Allen, Cristy West, Herb Parsons, Pamela Omidyar and the Bliss family; AP Board members; university partners such as the Fletcher School at Tufts, Columbia University (SIPA) and Georgetown (MSFS); and foundations like One Small Step and the Jessica Jennifer Cohen Foundation (JJCF). All have believed in our brand and helped to make it a success. Our thanks, too, to AP staff members who have managed the program since 2003 – Richard Blane; Adriana Boscov; Evelina Hobson; Stacy Kosko; Amy Burrows; Tassos Coulaloglou; Erin Lapham; Karin Orr; Katie Pettit and Karen Delaney. We also thank the many interns who have worked at AP and provided support to Fellows in the field from Washington. This has been a collaborative program from the start. Long may it last!